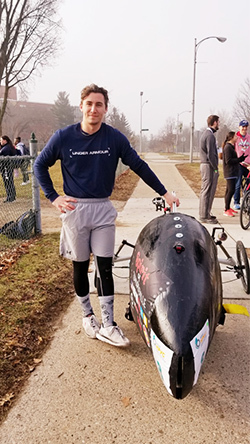 An interdisciplinary effort, spearheaded by Southern Illinois University Edwardsville students, and supported by the School of Engineering and numerous community donors, proved successful on a Michigan racetrack April 5-7. 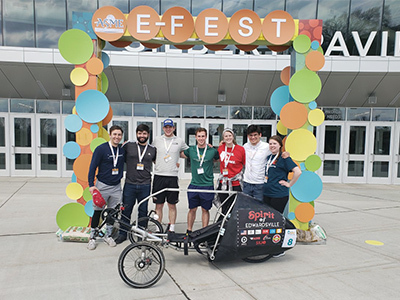 The SIUE School of Engineering student chapter of the American Society of Mechanical Engineers (ASME) placed among the best in the nation at the Human Powered Vehicle (HPV) Competition. Aptly named The Spirit of Edwardsville, SIUE’s HPV ranked 11th overall among 50 teams, including a 7th place finish in the women’s drag race tournament, and a 9th place finish in the men’s category. The competition considers standards of safety, durability, speed and design. Judges analyze a 26-page design paper and presentation, a safety evaluation, a men’s and women’s drag race tournament, and a two-and-a-half-hour endurance race. SIUE’s ASME chapter includes approximately 20 active members, eight of whom traveled to Michigan to compete. They included Cheatham, fellow mechanical engineering students Jeffery Clubb, Anthony Kindle, Nathaniel Kolesa, Joel Eberhart, Genevieve Bourgeois, and Holly Liebel, and industrial engineering major Tiana Sherman. Business and fine arts students also contributed to the team’s success. In order to combat high material and production costs, the SIUE team sought support from the Edwardsville community. Their outreach proved successful, with multiple local companies offering donations and material discounts to make possible The Spirit of Edwardsville. Cheatham emphasizes the value of being involved in a student organization like the ASME. Photos: SIUE students stand with The Spirit of Edwardsville, including team members (L-R) Anthony Kindle, Jeffery Clubb, Nathan Kolesa, Joel Eberhart, Tiana Sherman, Jonathan Cheatham and Holly Liebel. Human Powered Vehicle driver Anthony Kindle stands alongside his team’s creation.